Drain the tofu, and slice in half laterally – set onto paper towels over a flat cutting board. Top with additional paper towels and a second cutting board – set a heavy book/bowl/etc on top of the stack to press out the remaining water. Allow the tofu to set for 30 minutes. Remove the tofu from the stack, and cut into 1/2-inch cubes. Heat oil in a medium frying pan until shimmering (about 2 to 3 tbsp) – add the tofu cubes, and sauté until golden on all sides. Remove to a plate lined with paper towels. Place a small frying pan over low heat, and dry-roast the cumin until aromatic. Remove, and dry-roast the remaining two spices separately – add to a spice grinder (or mortar and pestle) and grind to a fine powder; set aside. Heat the oil in a heavy-based saucepan over low heat (with just enough oil to cover the bottom of the pan). Add the onion, and fry until soft and starting to brown. Place the onion into a food processor and purée until smooth; set aside. Reheat oil in the same pan, and add the garlic, ginger, spinach and tomatoes. Sauté for about a minute, and add the ground spices, onion, and garam masala. Gently stir in the tofu, and cook for an additional 3 to 4 minutes. Season to taste with salt, and serve. This looks really good! 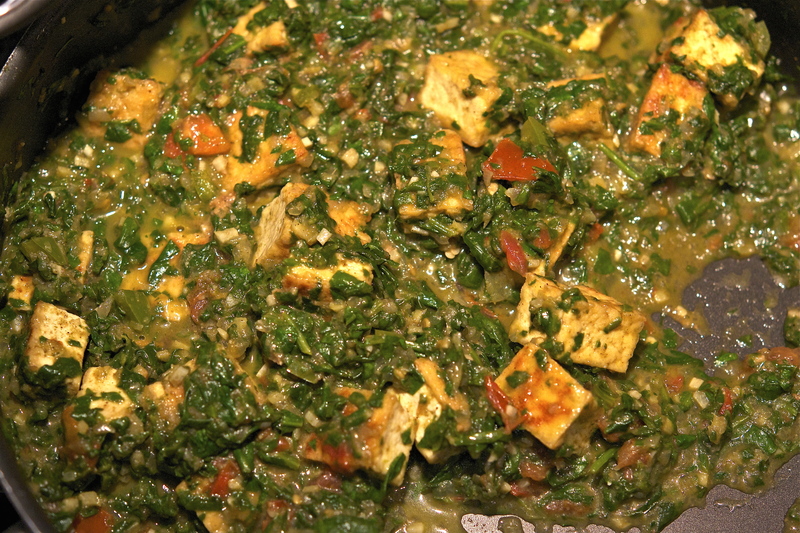 I recently made a saag witih tofu and like how it’s a light version of the more traditional saag paneer. This is a great dish – it’s my boyfriend’s recipe, who spent many months exploring India. Hope you enjoy it, and thanks for checking out the blog!